The American Library Association (ALA) has opened the application period for grants to develop public and school library programming that promotes computer science (CS) and computational thinking (CT) among youth. The grant opportunity, announced last month, is the latest phase of the Libraries Ready to Code (RtC) initiative of ALA’s Office for Information Technology Policy (OITP), sponsored by Google. 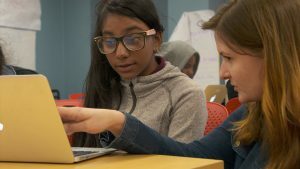 Through a competitive request for proposals (RFP) process, a cohort of 25-50 libraries will be selected to receive grants of up to $25,000 to design and implement youth coding programs that incorporate Ready to Code concepts. Through these programs, the library cohort will collaboratively develop, pilot and rapidly iterate a “Ready to Code” toolkit containing a selection of CS resources for libraries and an implementation guide. Libraries will base their applications on an accompanying RFP that describes the grant opportunity in detail. Selection criteria in the RFP aligns with the RtC vision that libraries play a critical role in increasing access and exposure to CS opportunity, changing perceptions of who can code and inspiring all youth to pursue CS education by connecting coding to individual interests. Libraries will be selected to include a representative sample of the United States, including geographical diversity as well as programs that focus on girls, youth of color and those from lower income communities. The Ready to Code project team will host an informational webinar on Tuesday, August 1, to supplement the detailed RFP and provide additional guidance to applicants. Interested applicants can RSVP to participate in the webinar at the RtC website. Proposals will be accepted through August 31, 2017, and selected libraries will be announced in October. A selection committee including librarians from OITP and ALA’s three youth divisions – the American Association of School Librarians (AASL), the Association of Library Service to Children (ALSC) and the Young Adult Library Services Association (YALSA) – are going to review the applications and select the grant recipients. YALSA will administer the grant program. Detailed information about the RtC grants, including the RFP and FAQs related to the program, visit www.ala.org/tools/readytocode.